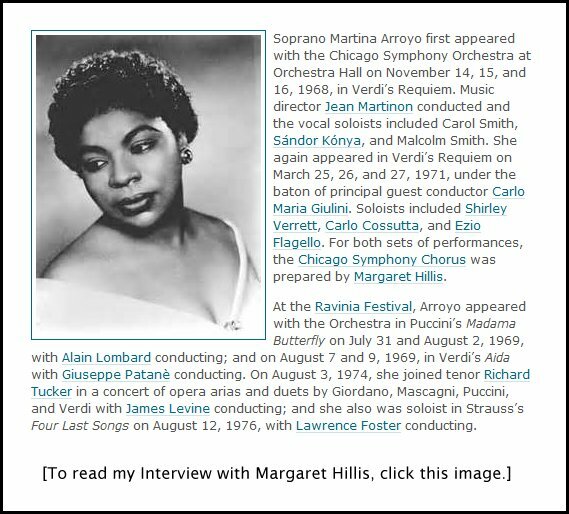 Martina Arroyo Interview with Bruce Duffie . . . . . .
American soprano Martina Arroyo has received numerous awards and accolades for her long-standing pre-eminence at the world’s foremost opera houses and concert halls, including a 2013 Kennedy Center Honors and a 2010 Opera Honors Award from the National Endowment for the Arts. She continues to make an invaluable contribution to the art form through her teaching and her commitment to young artist development through the Martina Arroyo Foundation. 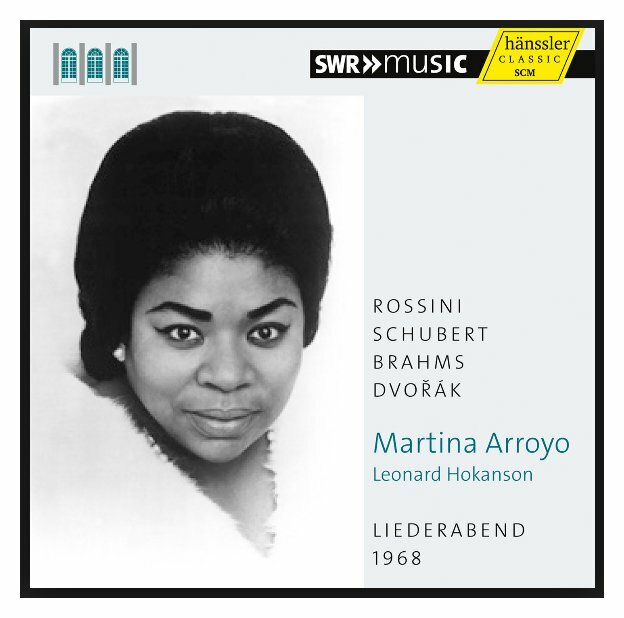 Born in 1937 and raised in Harlem, Arroyo went on to conquer the opera world, from the Metropolitan Opera to the Vienna State Opera, Teatro Colón in Buenos Aires to La Scala in Milan, Paris Opera to the Royal Opera House at Covent Garden, and the great concert halls from Salzburg and Berlin to her hometown of New York. She has had the honor of three opening night performances at the Met, two of them in consecutive seasons. Few in her generation have been so fearless or so successful across the repertory, from Mozart, Verdi, Puccini and Strauss to Barber, Bolcom, Schoenberg, and Stockhausen. 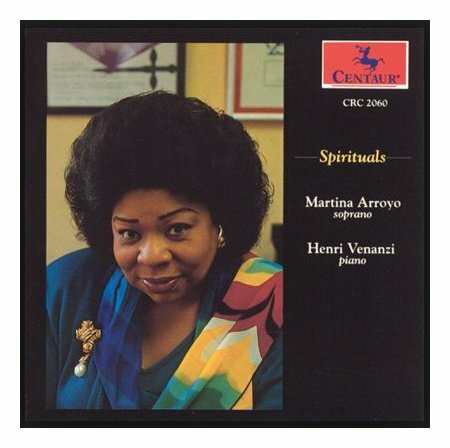 The New York Times once heralded her voice as “among the most glorious in the world.” Her extensive recorded legacy reflects her inspired collaborations with conductors Leonard Bernstein, Karl Böhm, Rafael Kubelík, Zubin Mehta, Thomas Schippers, Colin Davis, and James Levine. Arroyo studied to be a teacher, and graduated from Hunter College at the age of 19. In 1958, she auditioned for and won the Metropolitan Opera’s Auditions of the Air, which gave her a chance to study both music and acting at the Met’s Kathryn Long School. She made her Carnegie Hall debut in 1958 in the American premiere of Ildebrando Pizzetti’s Murder in the Cathedral, and in 1965 stepped in as a last-minute replacement for an ailing Birgit Nilsson in Aïda at the Met, a career-changing moment. 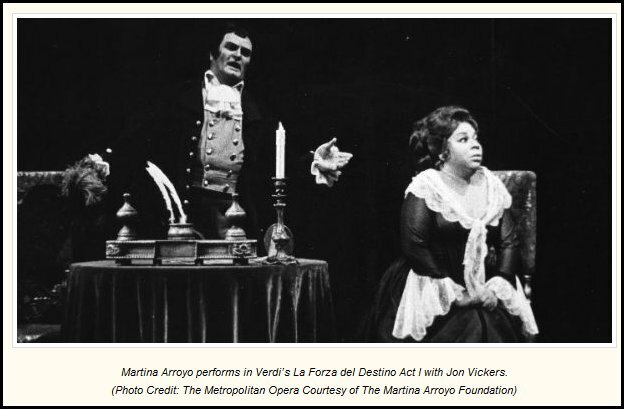 Over the years and in nearly 200 performances at the Met, Arroyo performed all the major Verdi roles that would be the core of her repertory, in addition to Mozart’s Donna Anna, Puccini’s Cio-Cio-San and Liù, Mascagni’s Santuzza, Ponchielli’s Gioconda, and Wagner’s Elsa. 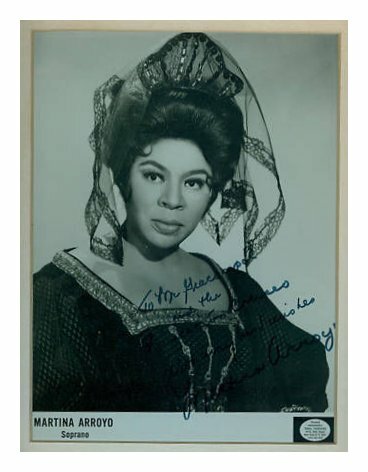 Her 1968 London debut came in a concert version of Meyerbeer’s epic Les Huguenots, followed the same year by her Covent Garden debut in Aïda. Her debuts at Paris Opera, La Scala and the Teatro Colón followed in close succession. 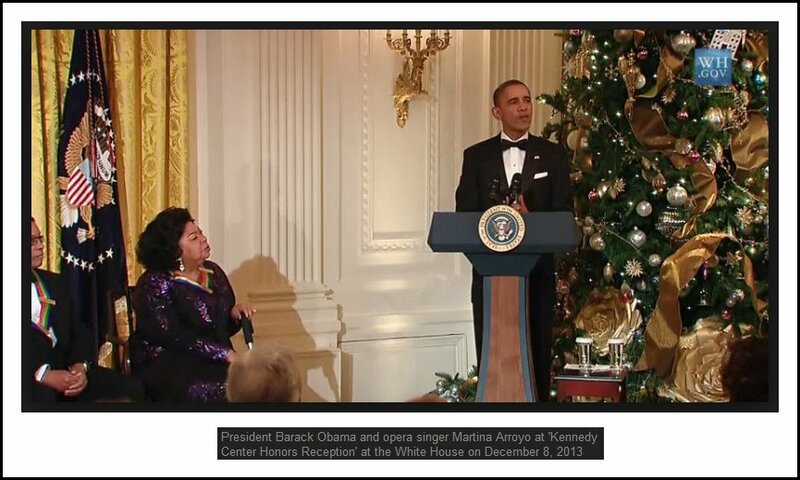 In 2003, Arroyo established her own non-profit cultural organization which provides new generations of emerging young artists with the tools to pursue careers in opera, by means of two intensive programs of study, coaching, and performance that focus on immersive preparation of complete operatic roles. 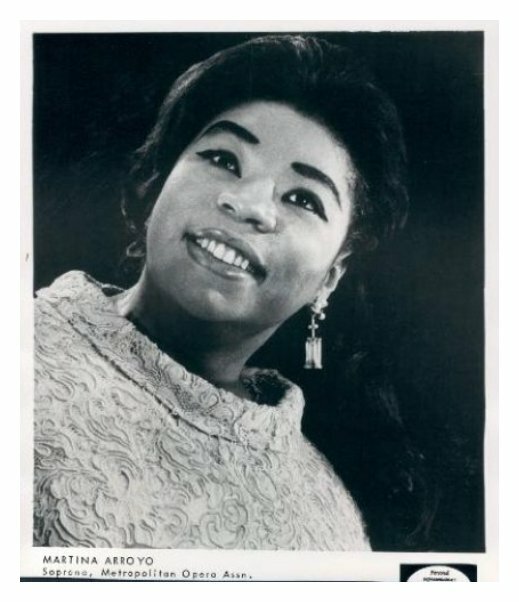 -- From the official site of Martina Arroyo. Arroyo sang quite a number of times in Chicago at various venues. She was heard at Orchestra Hall as well as the Ravinia Festival with the Chicago Symphony Orchestra, and at Grant Park, the Auditorium and at a few smaller locations. 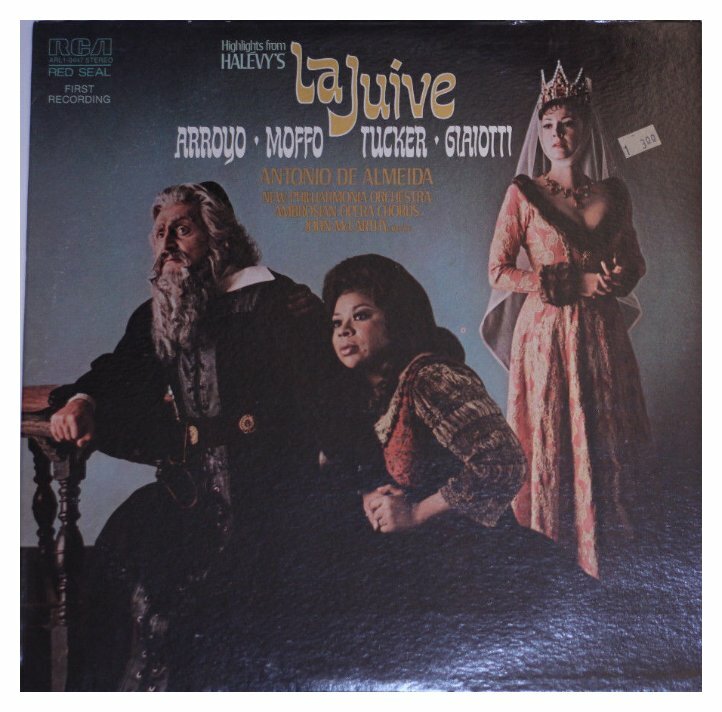 With Lyric Opera she sang Un Ballo in Maschera in 1972 with Franco Tagliavini, Sherrill Milnes, Ruza Baldani, Urszula Koszut, conducted by Christoph von Dohnányi and directed by Tito Gobbi; and she opened the 1974 season in Simon Boccanegra with Piero Cappuccilli, Carlo Cossutta, Ruggero Raimondi, conducted by Bruno Bartoletti. 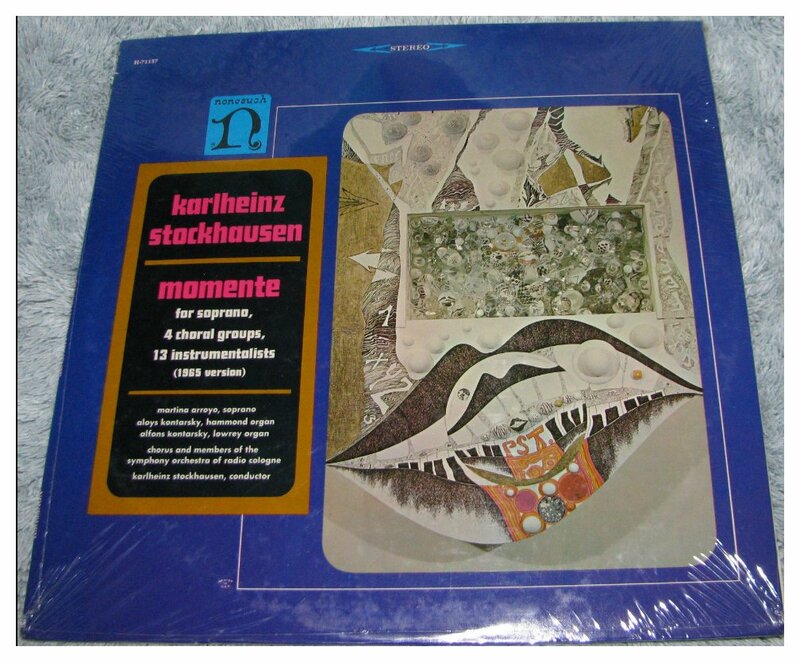 In September of 1988, she returned for Knoxville: Summer of 1915 by Samuel Barber, and Pace, Pace Mio Dio from Forza del Destino of Verdi with the Chicago Sinfonietta conducted by Paul Freeman. It was during this visit that she graciously permitted me to speak with her during one of her scarce free moments. As it happened, my interview with Jon Vickers had recently been published in Wagner News, and in it he mentions being particularly fond of Ms. Arroyo. So I gave her a copy of the magazine for her library, which is where we pick up the conversation . . . . . . .
Martina Arroyo: Oh, thank you! I happen to adore Jon Vickers and heard that he likes me too, which is wonderful because it’s so mutual. When you’re working with him, he has the qualities of Jimmy McCracken. They are real men; they are human beings; they are great artists. They give everything to the profession. There is this humanity there. They love their wives and their children. You couldn’t talk to Jimmy or to Jon without hearing about their families. It was so healthy. This meant a great deal to me. Bruce Duffie: I was in New York several months ago and had a nice interview with McCracken, just before he died. I had arranged it so that I did the interview with him and then an interview with Sandra. MA: Oh boy. Well, you’re talking to a great McCracken fan as well. BD: I have always been taken with his voice and the projection of his artistry. MA: Yes, but I think it comes from that one thing that’s so important — that human being who’s always there. The artistry is not on the left and their private lives on the right, but it’s all enveloped in these wonderful people. It’s not always the case. BD: You say that these two famous tenors are so manly on stage. When you’re on stage, do you try to be especially womanly? MA: I don’t think that you try to be. Perhaps it seems that you are because you’re reacting to them. They give so much. All you can do is give back, and if it means I am more womanly or more of the character — more desperate, more savvy — you’re not just putting on more personality and trying to be your partner as well as the role you’re playing. These people you are reacting to are very strong vibrations, and both Jon Vickers and Jimmy McCracken always gave and always give when they’re on stage. So does Sandra (Warfield), Jimmy’s wife, by the way. She’s another who gives to a point of almost hurting her voice. To her, the word is so important that she’ll just tear a line to pieces as Azucena, for example. We’ve done it that many times in twenty years, and my gosh, Sandra always gives it her last. BD: Do you always give your last? MA: I hope so. I sure as heck try, which makes it difficult. Sometimes you’ve got to say something in desperation, but you’re singing a Verdi line and you’ve got to rise up to a high C. You’ve got to be technically ready for it, and sometimes there is the conflict. In ‘Pace, Pace’ [in Forza del Destino], you want to say it one way, and someone says, “Would you mind just touching that note and making us feel the desperation in those words?” After twenty years I’ve been allowed to say it from my heart, but in the beginning you adjust it for conductors or for stage directors. Maybe everyone else does it like that, but that doesn’t necessarily make it complete for you as you portray the character. BD: Are you portraying the character, or do you actually become that character on the stage? MA: I hope that I become that character. I certainly try and identify with everything that makes her what she is, and bring everything that I can into my own being to make that character as alive as possible. That’s gotten better over the years. I have worked very hard to make the characters more believable. You have to work with them and live with them, and that’s also living with them in performance. 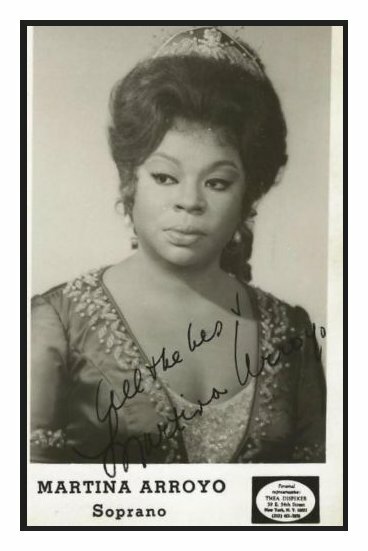 BD: Are there any characters that are, perhaps, a little too close to the real Martina Arroyo? MA: Ah, yes, but I’m not going to tell you which! [Both laugh] There are a few who are close in some respects. I’ve never been in a situation, for example, like Amelia [in Ballo in Maschera] with the conflict with her husband and the King (or the governor, depending on the production), but it is the vulnerability of this problem, the situation that I can relate to immediately. I love Amelia. I don’t think you should sing a character unless you do love her, or him, because you do it with truth. If you don’t love that person, or at least if you can’t identify closely to it because of a real truth for you, the audience knows. I don’t think you can say you’re going to behave this way or be this character and comment about it at the same time. You’re in the role or you’re not in the role, and if you’re in the role then you’ve got to do her honestly. And if you don’t believe it, if you don’t care about her, if you don’t care closely with real heart, it shows. You know the people on stage that are just indicating their character, and those who are trying to live it. BD: These characters — Amelia, Leonora and others — do they still speak to women and men in the late 1980s? MA: Oh yes, because you’re dealing playing the real truth. The emotions are truthful emotions, and even if your situation and your place and your costume might change, we still deal with love, hate, jealousy, various degrees of any kind of emotion that happen in one person’s life within the same period. 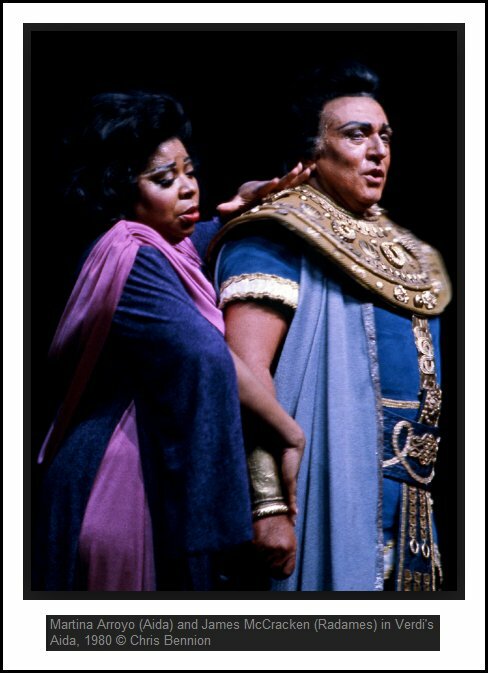 For example, when I am Amelia with Sherrill Milnes, who behaves in a certain way as Renato, the reaction is different from another baritone who is just as fine a singer but who behaves as Renato differently. You react very differently, so there’s a different degree of the character’s emotion, depending on what you get, what you give back and what’s going on between you. BD: So you adjust to your colleagues? MA: I think you adjust naturally. But of course you’re going to ask what happens when you’re getting nothing from a colleague? That’s the most painful situation of all because then, as Bette Davis says, you have to make love to yourself! [Both laugh] You have to make more of what you’re receiving. You get that earlier on in the rehearsal — if your colleague is giving very little, that you have to do more. However, even that shows. When it’s a real natural reaction and when you are giving a little more, then you can see what she’s getting from the other person. BD: Can you give too much? MA: I don’t think you can ever give too much. I hope that you don’t give to the point of hurting the voice, meaning that you can’t do what you have to do vocally. You can do certain things with the voice in Puccini, and people will still be with you. You certainly sing better for Verdi than for Puccini, but you should try to sing as beautifully for Puccini as for Verdi as for Mozart. But if there’s a little sob in my voice in a Puccini role I might be forgiven, where you wouldn’t be forgiven if you’re doing a Verdi line and you miss that line. BD: Is there a secret to singing Verdi? MA: Sing as well as you can and study as hard as you can. A good deal of praying is involved! [Laughs] There’s no secret about good hard work. That’s what it requires. It requires continuous study. I still take lessons after so many years. I called my teacher last night to tell her about the concert here, and the first thing she wanted to know was if I was able to float those notes. It’s continuous work. What you want to do is get yourself into such technical shape that you can bring the character to it and the technique works. Then you don’t have to turn the character off to turn the technique on. You sing well technically all through your development of character. BD: Do you sing differently when you’re on stage in costume as opposed to in a concert performance of the work, or just doing a recital? MA: Well, now you’re talking to an older woman. I’m not saying much older [laughs], but fifteen or twenty years have passed that I’ve been able to go on stage and do these roles. Let’s say closer to twenty-eight years, to be more honest, so that with the time you’ve learned to bring more of the character onto the concert stage from the performance stage, you can come into that moment in that person’s life and try and bring as much of the portrayal as you can. That’s hard to do when you’re very, very young but with the years you lose something vocally but you gain something dramatically. BD: [Gently protesting] I don’t think you’ve lost anything vocally! MA: I don’t know... I hope not, but I know that’s the cycle of life, and I’m not afraid of that. You always try to stay at high a level technically and dramatically as possible. That will vary within your week, or with how your health is going and how your relationships are going, as well as your love and spiritual condition. BD: So everything affects your voice? MA: Oh yes, much more so than people think. I remember a colleague of mine was told just shortly before she went on stage that her husband had been killed. That was such a terrible time. It was such a stupid thing to do to tell someone something like that. She got through the performance and then keeled over. Some other person may not have been able to sing a note just from the shock alone. You can have a cold. I’ve sung performances here in Chicago at Grant Park. We were outside and everything started well, then the wind and the weather changed, and by the end of the performance we were all [demonstrates being voiceless]. But the next night we were out there again! So certainly the elements affect you; everything affects you. That’s why I can always go back to someone like a Vickers or a McCracken, and see that the mental health of these people played such an important part in their vocal health. And that does affect their colleagues. BD: Does the whole idea of playing roles affect which offers you will accept and which roles you will decline? MA: Most certainly. I think that’s another gift you get with the years as they go by. When you’re very much younger, you’re so glad to get a job. You accept many things that maybe twenty years down the road you say, “No, I’m not particularly interested in doing that anymore. I’d rather do something else.” And if you’re lucky — and I have been lucky — I can do that now... but not always! BD: I assume that if there’s a part that fits your voice but you don’t like the character, then you’re in a real dilemma? MA: I wouldn’t do it! I believe that if I had the role and I didn’t like the character, that would show. If it didn’t fit my voice, you can be sure that would show. One of the problems today is the mistakes made by so many of the younger people. They are offered certain roles and they say they’ll do it just this once. Then you get caught in a trap. You’ll try it just that once, and you can do enough damage that it takes a long time before you get back to what you should be vocally. But I can understand if you get the right offer from the right person, it’s human to want to try it. And sometimes you even think that a role is good for you, and you do like it. But when you go out there and you put the drama behind it with rehearsals etc., you find out later that it might have been better to wait another two years. It takes a very big person to say, “No, I’m not ready for that,” and thank them and step down and give it somebody else! As far as the career goes, it makes a big difference. You accept the wrong things too often, and you might find yourself with a lot of spare time on your hands! It’s a very delicate balance. You have got to know how to handle these things, and heed the right type of advice whether it is from your teacher or from your manager, and whether you were thinking in terms of a thirty-year career or a two-year career. Not everybody wants a thirty-year career! MA: I imagine so. Not everybody wants to pack suitcases and travel all around for thirty years of their lives. Some people say they’ll do it for a while and then have children, or perhaps sing in one small area or sing small roles. Not everybody has to be Aïda at the Met. You can still have a happy life and a very, very professional career. I have friends in various houses in Germany that are very happy people singing everything with their families in one place. BD: They take the bus or the street car to work every day? MA: Maybe. Maybe they take their chauffeur, I don’t know! [Both laugh] They’re not willing to pack that bag every week, or every few days. BD: Are there some that are perhaps just singing themselves out for five years, figuring they’ll have the great career briefly and then pack it in? MA: Sometimes. I’m sure there are some that started out and have gone home when things petered out for them, and we haven’t heard of them since. There are others who had a more quiet type of career, and then all of a sudden burst on the scene. You think it is a new singer, but that singer’s been singing for twenty years in Gelsenkirchen! This is perhaps one of the most interesting things about this profession. There’s no one rule, and there are no two people that have had the same type of career. The success of a singer, and of a voice, has so much to do with being at the right place at the right time and being presented properly. Who are the famous singers in your voice range at that moment? Are you needed? Are you not needed? It’s too personal, it’s too individual, it’s too unique. There’s no formula. There’s no formula for a good technique for everybody and there’s no formula for a successful career for everybody. BD: Then what advice do you have for young singers coming along? BD: You go to the theater and you become a character. How long does it take before you are back to being Martina Arroyo? MA: Well, you’ve never really left her altogether! I can’t tell you what it is like for my colleagues, but for me it depends on the type of role. A role like Butterfly or Tosca takes much more time for me to come down because you get so wound up in these characters. Donna Anna takes less time, for even though you’re involved, somehow the verismo roles touch that nerve of the body that makes the whole body need more time. That’s all I can say. Amelia in Un Ballo in Maschera takes more time for me to let go than Aïda. That’s just personal. BD: So it varies then from role to role? MA: From role to role, from place to place, from colleague to colleague. When you sing a particular duet with a colleague that’s giving much more, you get all wound up in it. So when you do the opera and the whole evening with people like that are giving, it takes longer to pull out of the part. BD: Do you adjust your vocal technique at all for different-sized houses? BD: Is there any kind of competition amongst sopranos? MA: I’m a great friend of Monserrat. We love to go out and stuff ourselves with pasta! When I say ‘great friend’, I don’t see her very often, but I’m glad to see her, and I think she’s glad to see me. When I’m around colleagues, we don’t talk about music. Régine Crespin and I never talk about music. We’re great pals and we go out together, and the last thing we talk about is music. We might ask what each other is singing and we might talk about it, but we’re far more interested in the last date we had or something like that! [Laughs] Wouldn’t you be? BD: I think so! You’ve sung all over the world. Are the audiences different from city to city, or even country to country? MA: It depends on what you’re singing and who’s with you. If Pavarotti’s on the team, you can be sure that the applause will be louder with a bigger crowd. I don’t think you can generalize and say that this is what we’re going to have tonight. It depends on what you give to them. There are some cities where it’s customary for the audience to applaud after every aria, and so they do. But it doesn’t mean that in the cities where this is not done you are appreciated less. Often at the end of the act they show their appreciation. I don’t think that’s even a yardstick of the audience. You know when they don’t like you, that’s for sure! When they do like you, you know that, too, and it’s very gratifying. I don’t have a timer to know if it’s one minute more or one minute less in one country compared to another. You’re just glad that you’ve had something together. BD: When you’re taking the applause, you’re conscious of the audience. Are you conscious of the audience when you’re portraying the character? BD: Is there anything you can do when the audience is not with you? MA: It helps if you’re working onto your maximum, as much as you can. But even your maximum is not always the same. If everything is working for you and is going well, everything is going on with the others. Sometimes you react very much to your colleagues, or something is not going along with your colleagues. You can react with each other’s nerves. You give all the time — or at least I certainly do — but you don’t give on the basis of whether or not they’re applauding a great deal. You give on the basis of what you have to say and how it’s being said. Is the person reacting to you? It’s a give and take, but if it’s happening, the audience is with you. I’ve never been in a performance when something was happening on stage and the audience didn’t like it. So one way or the other, I don’t even imagine that situation. I have been in performances when not a lot was happening on stage and the audience was giving out like crazy. I am not talking about giving or about applauding, I’m talking about there being something in the air. There’s something, and you feel you’re there to enjoy. Therefore there’s reason together to entertain you. You’re there to be entertained, to enjoy the evening. A few weeks ago I went to see Mefistofele at the State Theatre in New York. I had not seen Mefistofele before, and I was excited, I can tell you. I went in ready for a good performance, and they didn’t let me down. They were wonderful, the whole cast. It was a good performance and I left there on cloud nine, and so were my friends and our crowd. The people on stage must have known that we were happy to be in the audience. We knew that they had made us happy, and so it’s there. I wouldn’t want to measure it! BD: You brought up a word I want to ask about — entertainment. Where is the balance between the entertainment value and the artistic achievement? MA: It depends on who you’re talking about and what you’re talking about to a certain extent. If you are talking about me personally, I feel that I work at my highest artistic level, and then I’m entertaining you as well as I can! I don’t think the word ‘entertainment’ has been used for popular and artistic achievement the same as it has been for classical music. I know people like to make that sort of differentiation. When I say, for example, that I’m in Show Business, they go, “Ugh! You’re not in Show Business, you’re an Opera Singer!” But I say, “Yeah, but that’s Show Business! We ought to get out there in can-can dresses. I’d love to see Montserrat, Jessye and I in can-can dresses! Couldn’t you imagine that? MA: [Laughs] Three *little* maids... that’s already funny! We’re there to bring joy and happiness into the lives of the people that have come to see it. It’s Show Business. That’s not a derogatory phrase, in my opinion. BD: Are we getting conductors today who understand the tradition of the theater and how to get inside the roles as much as we used to? MA: Oh yes, I think so. You have people like Riccardo Muti who, especially in the recording of Ballo wanted the theater. Colin Davis wanted the theater in the Mozart. He said he would rather sacrifice a tone here or there. I was doing Donna Anna in that recording, but he wanted to feel what was going on between the characters in the recording. So certainly conductors are there. I don’t think that the conductor who said for me to sing that top tone piano meant that he didn’t want character. He perhaps knew the tradition of it being sung piano and wanted to continue the tradition. It is for us, after he says that, to put the intensity into the part the same way the conductors are asking for other things without losing the character. You adjust to how you feel about those words or how you can say them. As you know, in life you can say, “Oh, that’s a very nice dress you are wearing.” Or, [snidely] “It’s a very nice dress you are wearing!” Or, [loudly] “MY, that’s a very nice dress you are wearing!” You’re still saying that’s a very nice dress but you’re saying it differently. You’re taking about the intensity of the situation, the dynamic. It’s wonderful when we have the opportunity to have two or three weeks of rehearsals. I mean that sincerely because so often we are on stage with just a three-hour run-through. These days, the conductors and the stage directors go into each other’s rehearsals. They have for many, many years. This is important not only to know what you’re being asked to do, but if you can do it at this tempo. There has to be a collaboration. There must be a very, very close collaboration between the director and the conductor. If a director has an idea that a part may be portrayed a particular way, and you get a character or a personality that can’t do it, you make adjustments, and the stage director will make them. The conductor does it all the time. One singer can sing those two lines in one breath, and another can’t. That doesn’t make one better or the other less. MA: It’s just different, and that’s very good. That’s what makes you not mind seeing your fiftieth performance of Un Ballo in Maschera. BD: Is this what separates the great operas from the less great operas — that they can stand being on the stage night after night, week after week, year after year? MA: I think it’s what separates the great singers from just the singers, I tell you that! But certainly it is all of it together. There’s no one factor. We can sit here and talk for the next five years and never reach the end... or even say anything that’s definitive or conclusive. Bring another singer in, and we could start all over again. That’s what I like. BD: Let me look at it the other way. Can a piece get over-rehearsed? MA: [Thinks a moment] I’ve never run into that situation, to be perfectly honest. I imagine when you’ve sung something many times... like when the people on Broadway in the long-running parts. Singing Jean Valjean in Les Miserables every single night, eight shows a week, is so intense. That’s like over-rehearsal, isn’t it, and yet we don’t feel that in the audience. I didn’t have any indication that these characters were any less alive than they must have been the first night, and this was after some months. BD: I was thinking about a Felsenstein production where they would rehearse for a year. MA: Oh, I would have given anything to work with Felsenstein for one year on a part. You never get tired of some parts. There are too many factors. How you give, how you take, you just don’t get tired of finding the other ways it can be said. BD: Do you sing differently at all for the microphone than you do in the opera house? MA: Psychologically, yes. You say that you’re not, but having a microphone in front of your nose blows my mind! I just don’t like the idea. Remember we were talking about knowing the fourth wall is there? Well, it’s worse when you have something shoved right in your face. When there are no mikes up in front of the nose, I’m just singing and relating to people personally. That person might be there [points close to us] or might be way over there [points far across the room], but it’s a human being that’s responding. BD: After everything is all done, are you basically pleased with the records that have been issued of your voice? MA: I don’t know... I’ve never really heard me. There’s always the first shock of hearing yourself. Just two weeks ago we were recording some songs for Centaur Records, and I kept saying, “That’s not me, that’s not me!” Then I kept asking, “Is that me? Is that me?” A thousand years ago when I first heard my own speaking voice at a rehearsal of Macbeth, the singing voice sounded what I think I sound like, but all of a sudden I heard this speaking voice and I thought, “My God, someone has changed the speed on this tape.” I didn’t realize I have such a high speaking voice, and hearing it like that blew my mind. I went to my teacher and asked for help with the speaking quality. He showed me how to speak more deeply, which works for the stage when I need it, but it is not how I normally speak. BD: Most of the characters you’ve sung have been victims, or in tragedies of some kind. Do you do some comic operas too? MA: I’d love to do a comedy! As a matter of fact, I turn some of the most tragic victims into the funniest ladies! First of all, it’s not easy to make people laugh, and secondly there is that fine line between tragedy and comedy. All you have to do is exaggerate drama just enough and you can turn it into something hilarious, which I enjoy doing. Sometimes when I’m rehearsing it’s getting heavy, and when you’re feeling the weight and the intensity of a rehearsal you find yourself doing something so stupid just to break the tension. You might say something so dumb that you sometimes are so ashamed of yourself later, but you just can’t help yourself at that moment. You need to get it out, and then everything’s all right. BD: And your colleagues understand this? MA: They’re doing it too! [Both laugh] That’s the nice thing about it. BD: You’ve sung many roles. Are there still a few that you would like to sing that would be good for you psychologically and vocally but no one’s asked you for them for one reason or another? MA: There have been a couple of roles that I haven’t sung because the circumstances for them weren’t right. 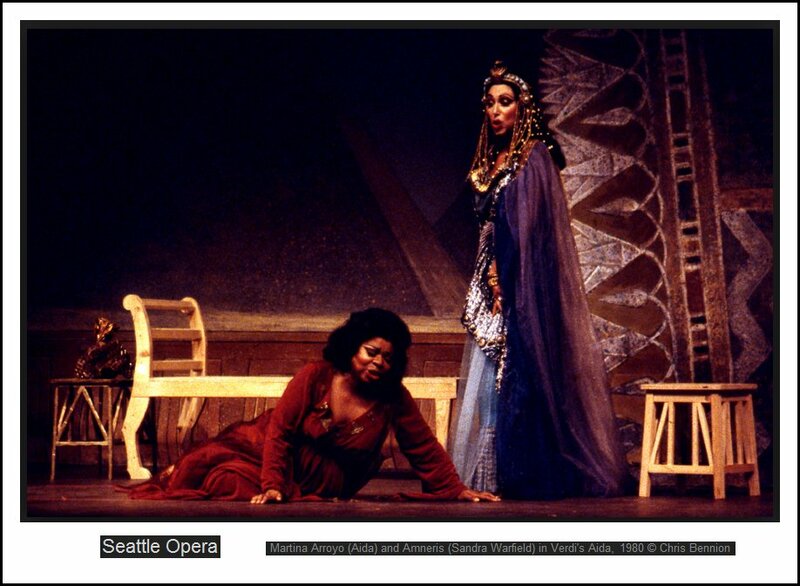 I was a little bit young, but I wanted very much to sing Norma — but only with a lot of rehearsals and a really good stage director who would take me at a good pace. I’ve learned a lot about acting in the last twenty years, but twenty-five years ago nobody ever called me Madame Bernhardt, you can believe that. And Norma, as beautiful as the music is, can be the biggest bore on the face of the earth if all she’s doing is going through the exercises of the music. Not only do you have to have good singing, you really have got to make this woman live. I passed the opportunity to sing the part because, at that time, it just didn’t all come together. Next year I’ll be singing my first Dutchman, and I’m looking forward to that. BD: Tell me about Senta! MA: I’ve had lots of feelings about her. I haven’t had the time yet, and I’ll begin now, as a matter of fact. I browsed through the part with one of the musical directors of the Grand Rapids Opera. I need to begin to feel through this part because as you’re learning it you want to know a little bit about who you are and why you are and what makes you say what you do. BD: But obviously there must be something that tells you you want to do that role. MA: Oh yes. I went through it vocally. I’ve been interested in the part for several years, just the times that I’ve wanted to do it were a little too early. Now I think it’ll be right. It might have been a few years ago that was right as well, but I wasn’t asked a few years ago. Now it’s come together. MA: Oh, I’ve sung Elsa some years ago at the Met in the Wielend Wagner production. That was fun, and I always enjoyed singing Wagner. My agent is going to kill me for saying that. [Both laugh] I’ve always wanted to do Strauss. I love the part of the Marschallin. Fifteen years ago I wouldn’t have attacked her because of the character. I didn’t have the time and the means to really learn the Marschallin, and to work at it properly to really bring the role the way I’d want to. It’s not enough for others to like you. You have to please yourself as well. There’s a Mahler song I’ve never sung because I can’t get through it the way I want to hear it. And since I can’t do it, there no need to make anybody else suffer. I can’t do it for me, to please me the way I think it should. I’ve heard others do it. Christa Ludwig still sings it and it brings tears to your eyes. I’ve had students of mine sing it beautifully, but I haven’t done it yet the way I want to sing it. So I just leave it alone until that happens. BD: And it will happen! MA: Yes, of course I think it will. BD: Are there other roles that are going to happen? MA: We are playing with some new ideas that are interesting, very interesting indeed. I’m glad to be singing Turandot, for example. Twenty years ago that would have been a no-no, a big no-no. MA: I did Liù at the Met, but now I’m doing the Princess herself — and my way. You don’t get the steel or the larger sound of a Dimitrova, but you get me singing my way, with my voice and my characterization of the Princess. BD: Are you going to be a better Turandot because you were a Liù before, and understand that aspect of the opera? MA: I think so. I was very fortunate. I had Lotfi Mansouri as the director for the first times, and he molded that character with me, with my voice and how I felt about her, and his feelings about the role. It’s never a one-sided thing. You collaborate, you talk about it, you work on it, you see what you can do. You see what needs are the strongest and what is saying something. Keeping that in mind, he really worked with me in such a way that it was a personal Turandot and it was a warmer Turandot. She breaks down sooner than some of the trumpet-sounding voices need to because they just stand there and belt it all out. I can’t do that. In fact, Puccini says that Turandot feels saved. “From the moment I saw you, I knew there was something for me.” This was a man that she feared, so Turandot doesn’t just break down at the end in the last duet. She is beginning to be gnawed at and chipped at. She starts to crumble and says from the moment she sees him that she knew that he was different from the others. We used that to begin to mold the phrases a little bit to suit my voice! BD: That sounds like the way that Eva Turner did the role. MA: I’d like to think so, because you have now mentioned another one of those magic ladies. Eva Turner is still alive, and she’s still one of the most beautiful colleagues and friends you can have. I call her whenever I’m in London. I ran into Gwyneth Jones a few weeks ago, and the first person we talked about was Eva Turner. She’d seen her a couple of weeks before that, and she was alive and kicking. Eva had helped Gwyneth with her Turandot, and I’d called and talked to Eva about the role. But you can do that. You can call up and tell her what you’re doing and ask what she suggests. She doesn’t go, [in a haughty British accent] “Tut, tut, now darling. Maybe you shouldn’t be doing this!” She helped me from the opening night of Trovatore at Covent Garden. She sat down and she sang Trovatore with me at the reception. She went through the part and we talked about it. I love her very, very much. This is the type of healthy lady I’d like to be at 95. BD: I did a 95th birthday program for her [on WNIB, Classical 97 in Chicago]. She allowed me to call her in London for an interview, and we talked for about twenty minutes. MA: [Enthusiastically] Isn’t that great! MA: ...and they were all there, weren’t they? BD: On the nose, every one of them! MA: Every one of them! This past June was the first time I sang in London that she wasn’t in the audience. I don’t think you know it, but you feel the absence of a good friend. She’s incredible! BD: Oh yes! And she rrrrrrrrolled her rs in the most marvelous way! MA: Oh, indeed she does! I love her, I just love her. She told me, “Oh, you’re taking too many breaths in that Trovatore. You need to make those phrases longer,” and then proceeded to sing through the arias! She never stopped loving. That’s one of the things that I like so much about her — she never stopped loving. She’s loved and she loves us. The day when we step down, we have to turn around and give that love to the ones coming along. That’s the way it’s supposed to be. The cycle goes on. BD: Tell me a bit about the other Leonora, the lady of La Forza del Destino. Is she a sympathetic lady to portray? Is she easy to portray or fulfilling to portray? MA: She’s not an easy lady to portray. If you play her superficially — just whatever happens to her happens and she lets fate take her where it has to go — it’s almost easier than if you really try to work with her. This girl loves her father and loves her home, and it terrible to do something against someone that you know is going to hurt them. In the end she does sacrifice her own happiness for him, and he, too. You’re not talking about a clear good person or a clear bad person. You’re talking about very wonderful people themselves that are hurting each other. They are causing pain but not wanting to. They are causing unhappiness they don’t want to cause. They are forced to commit acts that they ordinarily would not commit. BD: Is she a victim? MA: Somehow in a way they’re all victims, but very noble victims. They’re not small; that’s what makes them so difficult to portray. They must be bigger than ordinary. They make statements. They are large people encased in nobility. She’s not a crying little girl. She’s rises above the situation. She is able to finally say that this is her choice and she is making it. She is going to end life this way. On the other hand, you’ve got the other person who says that’s a lot of baloney! She must get out there and live and fight until the end. The answer is not to live the life of a recluse or to make that sacrifice. It depends on your point of view and how you feel about life and how life has treated you. It is about what you know about life. BD: Do you learn more about life every time you sing that role? MA: You learn more about life the more you live. The more differently you treat that role is because you always have to remember that we’re talking about playing Leonora, and at what point you leave yourself and pick up Leonora, and how they interact. We’re getting awfully deep in here, but we can’t afford to stop analyzing and stop feeling and stop wanting to know more about the character. As long as you get up and sing this role, you’ve got to care and want to know more and feel more to care more, to live more with her and about her and for her. The moment you say you’ve learned her and that there’s no place to go from here, put the role down. It’s going to become stale; it has become stale. I don’t want to bore the public with what I live with. I want to bring them the final version for that moment. This is how it is today, and then tomorrow or two months from now something else has happened and you’ve learned how to treat a word another way bring it to them that way. Perhaps a colleague makes you feel that you should put the emphasis on some place else, and you bring it to them that way. I don’t think that it’s always right to make the statement before the person has been allowed to see it and feel it. You have your own opinion about what you’re doing about the part. It’s like the young athletes today. They have to run the race and then they have to apologize for not having won it. They have to explain why they didn’t win it and how they feel about the next runner because he’s the winner. How the heck is he supposed to feel??? He lost!!! Why should he then be subjected to explaining to the public what is going on in his mind? It’s not enough that he’s run the race. I’m particularly saying this right now because I’m annoyed at the Olympics and the insensitivity of handling the young athletes and the old ones. Chrissy Evert had just walked off the field. She’d lost. She’s a great player, and then they were asking her how she felt. BD: When you’re singing on stage, do you feel it’s like the Olympics every night — that you’re being judged on every nuance and every phrase? MA: I can’t stop and think about that while I’m singing. I’m worried about Tosca, and Tosca has no time to think about the Olympics. They did not happen. She was not involved with the Olympics. If she’s going from dealing with Scarpia, Carl Lewis is the last person on her mind! You just can’t think that way. There have been nights when, at the end of performance, you think gosh, a lot was given, or a lot was received. Maybe I got a little bit closer to what I feel about Tosca, but most of the time you think about what happened tonight and what I can do with that. Why did that happen and maybe I can use that. Maybe it’ll happen again this way so that I can use it and do it differently. You stay with the character. As far as being an Olympic sport, I don’t know! BD: What if anything do you expect of the audience that comes to the opera? MA: I hope they’ll enjoy it, go home and want to come back! That is telling me whether I’ve done well! BD: Do you like the idea of the supertitles in the theater? MA: Yes, I do. I love the idea of a person who might not take the chance to spend three hours in a theater, listening to music in another language that they don’t understand, being able to come and enjoy it. This is especially true in the Mozart operas where there’s so much recitative. If they can read it and watch it at the same time, maybe they’ll come. It’s happened in city after city. In Salt Lake City when we had Butterfly — which a simple story line — but you’d be surprised how the people reacted to the small phrases and the little things. BD: So there’s more communication? MA: Sometimes, and when there is, if it happens to ten per cent of the audience or even to one per cent of the audience, if one child begins to say he’d like to come again, I think it’s worth it. BD: Do you feel opera is for everyone? BD: Yes, that’s true! Most of your parts you wind up dead. Do you like winding up dead? This conversation was recorded at her hotel in Chicago on September 26, 1988. Portions were broadcast on WNIB the following year, and again in 1991 and 1996. This transcription was made in 2014, and posted on this website at that time. My thanks to British soprano Una Barry for her help in preparing this website presentation.